I am thinking of events such as Dr. Martin Luther King’s “I Have a Dream” speech…the fall of the Berlin Wall…the end of apartheid in South Africa. 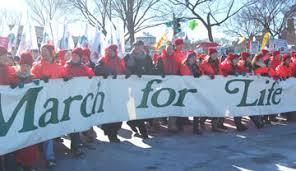 For those who participated in the 2019 March for Life–either in person or “virtually” by watching it on television or Facebook feed–the March feels like such a breakthrough historic moment. President Donald Trump addressed marchers via a recorded message from the White House. In-person speeches by Vice-President Mike Pence and his wife Karen emphasized high-level support for the March’s goal of rebuilding a culture of life. It is wonderful that at least 100,000 and probably considerably more, came to the Washington Mall to commemorate the 46th anniversary of Roe v. Wade. But is critically important that we build on that moment and keep the momentum going. Tell your family and friends about your experience at the March. Email photos to your contact list. Post pictures on social media. My Instagram feed has been exploding with pics from young marchers, and that helps to energize the movement. Write a letter to the editor of your local newspaper about the March. Blog about it. Go to the NRLC Legislative Action Center and contact your Congressional Representative and Senators about pressing pro-life legislation. Schedule an appointment with your state legislators to discuss pro-life issues. If you are a student, join or start a pro-life group at your high school or college. If you need pointers, contact NRLC [stateod@nrlc.org]. If you are older, join a local chapter affiliated with NRLC or, if you are already a member, resolve to be more active. We are standing at a historical precipice. By following these three simple steps, you can help hasten the day when Roe v. Wade is overturned and every preborn child, person with a disability, and elderly American is cherished and protected both in life and by law.